A few weeks ago I attended several LDN Social Media Week talks at the London College of Fashion, where one theme that numerous speakers seemed to dwell on was the increased reliance on visual content in marketing, particularly in the travel, fashion and luxury verticals. Visuals such as images and video content have always played a key part in marketing campaigns but we have never been subjected to such a barrage of visual information until now. Although companies are more than happy to flood us with an excess of information, we don’t actually tend to digest as much useful data as we would like if it’s presented in the wrong format. Humans are visual creatures - according to MIT it takes just 13 milliseconds for the human brain to process an image, whereas the process is three times as long for a word. This means that we also absorb information faster when it’s presented in this way online (just look at the rise of infographics and BuzzFeed articles), although it wasn’t until recently that the web finally caught up to our natural inclination towards visual content. With the improvement in data speeds for our mobile and desktop devices, consumers are hungry for information rich content they can access instantly at the touch of a button. Recent developments in the industry (such as responsive design becoming invaluable in 2014 and rumours surrounding Google’s ranking algorithm factoring in UX elements such as bounce rates and time spent on site) display the importance that search engines are placing on providing users with great content for every search, regardless of device, time or location. The continued rise of social media has also inadvertently contributed to the rise of visual content use on the web. Google is more sophisticated at identifying images and the content they contain than it was a decade ago. It can accurately track social shares across a number of platforms, which in some ways is a more natural way to rank content than simply changing page titles and meta descriptions. Visual platforms such as Tumblr, Pinterest and Instagram have exploded in popularity. Instagram can be considered the first billion $ app, Tumblr was recently acquired by Yahoo and Pinterest raised $200 million in the latest round of funding, which values the company at over $5 billion. Considering the company has yet to turn over a real profit, the confidence from investors is telling. We can partially attribute the rise of platforms such as Pinterest and Instagram to a change in shopping habits, as consumers have become increasingly more likely to research a product or service online prior to purchasing it. Pinterest is a great way to curate products for inspiration/mood boards regardless of what the product is, as long as it visually resonates with you. Instagram on the other hand serves as a great way to build brand or product awareness, because of its minimal design and the removal of links allows more focus on images and video. Pinterest and Google seem to be operating with the same user centric ideology in mind, provide the right information, in a succinct manner without overloading them with unnecessary content. This is why Google is now recommending that sites add schema markup to their product pages as schema helps search engine spiders understand content, structure and type. This development also led Pinterest to rollout their Rich Pins last year by taking advantage of the markup structures already in place. Rich Pins allow a user to pin products from selected stores that contain information such as product price, size and stock availability, which is fantastic from a user experience point of view. Rich Pins are tied in with emails, so any Pinterest user that has pinned a product will be notified by email when the price of that product drops. It doesn’t matter if that user has never visited the site or signed up to email marketing, they will still receive an email that’s product specific and centered around something they have already shown an interest in. A recent study found that Pins with prices get 36% more likes than those without and American retailer Target saw a 70% increase Pinterest referrals after enabling rich pins. Pinterest and Tumblr are also very reliant on their browser add-ons, which allow users to add images to their profile regardless of location, creating a backlink for the brand and keeping the user engaged with the site. The rise of visual data platforms and their ease of access has also provided new opportunities for content curators such as iphonographers, bloggers and vloggers. They can not only find a large audience for their content more easily, but they can also ditch uninviting pages of text in favour of images and video. Platforms such as Tumblr and Pinterest should not be discounted simply as visual inspiration platforms because they also contribute tangible benefits such as referral traffic, brand exposure and content impressions. Above, I’ve included a screenshot of my personal Pinterest profile and it’s hard to ignore the impressions and click throughs that my site is generating from a relevant audience thanks to the Pinterest platform. So how does the rise of these platforms and visual content impact on brands? I believe that great brands differentiate themselves by engaging a potential customer at any point of the decision making process. Platforms such as Pinterest and Instagram help to capture that initial attention and interest for a specific product, destination or experience. Online activities can also have an impact offline, such as increasing footfall traffic into the stores on the high street (research online, purchase offline) and there have been experiments where stores changed their visual merchandise and layout to reflect the products that had been most engaged with over social media. This actually had a double impact of not only increasing the sales in those particular stores, but also the post purchase shares of the products and outfits themselves. Relevant content can also be repurposed to improve an overall site and user experience. A company by the name of Olapic is successfully taking advantage of the data currently being generated by developing a technology that solicits, filters, and re-purposes any voluntarily shared user-generated images. 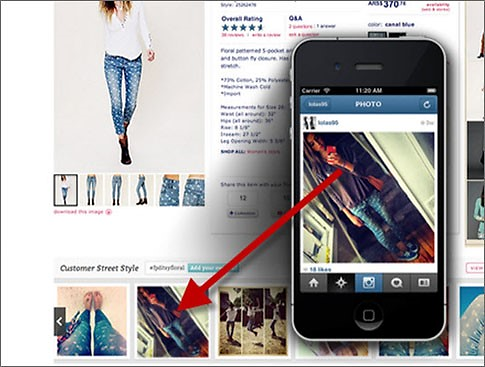 Brands such as ASOS, Gap and Hard Rock have recently experimented with this, by including product or location specific images directly on to the pages themselves and so far it’s receiving encouraging results. Data from Olapic shows that consumers are much more likely to identify with a product or service if it’s shown in a real world situation e.g. someone other than a model wearing a product that they are about to buy, or an image of a happy kid jumping on a hotel bed as opposed to a stock photo of an alarm clock. Although the company also states that Instagram gets the most engagement, it can upload user images from a diverse range of platforms such as Facebook, Twitter, YouTube, Flickr, or even Vine if it’s relevant to the business in question. Because Olapic provides an analytics dashboard, users can quantify how many photos led directly to conversions or engagement and also identify the most influential users to be shortlisted for any outreach schemes such as a content piece or giveaway. Having already discussed some of the tangible benefits that can come from visual marketing platforms, it is no surprise that increasingly brands can also advertise to the customer directly and expand their reach on these platforms. Both Instagram and Pinterest have recently conducted UK testing of sponsored posts / pins and this introduction will nearly tie together creative and marketing teams with the data gleaned from their organic efforts. The shift towards these platforms providing quantifiable results extends also to their developing analytics capabilities. Platforms such as Tumblr and Pinterest display useful information about images and sponsored posts and this information can be used for the optimisation of future content planning and recognising trends ahead of time. The importance of visual content in marketing is undeniable and it’s becoming ever more prominent with the current ‘ME-generation’ of bloggers and social media addicts. Social Media is gaining momentum as a collection of viable marketing tools and it’s a testament to its rapid growth that brands such as Chanel receive 58 million impressions a month on Pinterest without ever having an official account (source: Fashionista). It is also apparent that with the introduction of granular targeting via internal advertising platforms, these networks recognise their growing importance to marketers. Businesses in 2015 are likely to face new challenges both online and offline; engaging new customers across channels should be seen as an ongoing process. Because of the lower barriers to entry in digital, businesses will face increasing competition and this means customers have a bigger freedom of choice than ever before. Forrester Research have proclaimed that we have reached the ‘Age of the Customer’ and it’s business that provide the greatest customer focused engagement strategies online that will stand out from the growing competition. At Forward3D we use a more visual approach to content creation through storytelling and creating brand pieces that people are most likely to engage with, such as teaming up with bloggers to showcase a festival experience through a Go-Pro camera or an interactive city guide that takes the users on a journey around the city, recommending items to wear during their planned day out. Google’s (and other global search engines’) understanding of visual information (Link) and social sharing is only going to improve, so incorporating visual content and the data it provides into your marketing strategy will help with user experience, greater customer engagement and long term value for the brand. The businesses and brands that understand how to incorporate visual content into their marketing strategy to tell stories are the ones most likely to stand out and be talked about in the marketplace.